Story centers on the aftermath of a suicide bombing in Indonesia, where a reckless American posing as a grad student is bent on vengeance but quickly finds that the world's problems can't be solved with violence alone. A mysterious American Marine/FBI agent Jake Travers (Kellan Lutz) teams with a Muslim cop Hashim (Ario Bayu) to hunt down a dangerous international jewel thief Malik (Mickey Rourke) who kidnaps a Sultan's daughter Sultana (Atiqah Hasiholan) in a plot to steal the royal treasury: exotic intrigue amid ancient palaces, mosques, temples, subterranean labyrinths and stone pyramids in the heart of Java. Written by H.G. Hashim: Mr. Wilde, Allah give you two eyes and one mouth so that you might see twice as much as you speak. Java Heat is an unthrilling thriller weighed down by the wooden acting of Kellan Lutz. 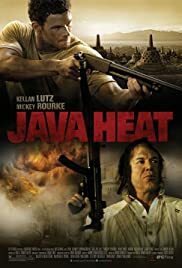 On the plus side, for a movie named Java Heat, this movie does convey a reasonable impression of being set in Indonesia, and for those who've spent much time in Indonesia, it's a rare treat to see it feature in a Hollywood blockbuster. Indonesian language is used in parts, although there are several places where the Indonesians speak English, presumably to aid intelligibility. The film isn't wholly convincing, of course, in its portrayal of Indonesia, we are told at one point that a jewel worth a few million dollars could 'feed the people of Java' for a year, a pretty silly statement given the island's ~150 million population. While the picture is rather grainy in parts, there's plenty of detail on the blu-ray release, and the audio mix is excellent for a film of this budget, with all of the channels used pretty much constantly for diverse effects and environmental audio. 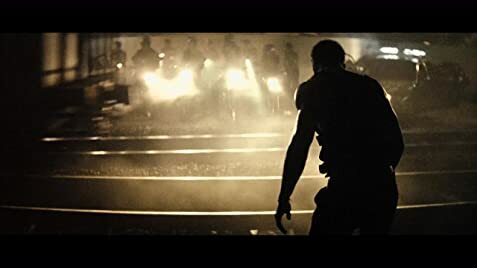 As for the story, it was hard to really bring oneself to care about it, the Indonesians in the story are one-dimensional, either bland and helpless or else cardboard-cutout jihadists, while the muscle-bound American hero of the piece lack emotion or charisma. The movie is in the buddy cop genre, with Lutz paired with Ario Bayu, but there's little rapport and no humour. My wife, Indonesian herself, went to bed before it was finished, as the story was so tedious that she saw no reason to watch it to its predictable-from-the-outset conclusion. It reminds me of watching a Steven Seagal movie, and not one of his better ones. To find a decent movie set in Indonesia you probably have to head back to 1982's The Year of Living Dangerously, with Mel Gibson and Sigourney Weaver. Any hopes that this would break the mould, are sadly unfulfilled.